"Both Randy and I have many wonderful childhood memories of..."
"Dewayne was a huge part of my life. He was much more than..."
"I miss you papa. I will always miss you. Im happy your out..."
"I am so sorry to hear of Dewayne's passing. 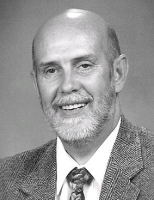 He was a good..."
Dewayne Howard Hanson, a Camas, WA resident, died at his home on Tuesday, July 28, 2009. He was 64. Mr. Hanson was born May 1, 1945 in Richmond, CA to Ruth (Kilen) and Palmer Hill Hanson. The family moved to Washington state when he was an infant and he spent most of his life in the Vancouver area. He graduated from Fort Vancouver High School in 1963. Dewayne and Shirley Easterly were married in 1964 and they moved to Camas in 1972. He worked in the grocery industry - mainly for Prairie Market - for many years. About 1980 he went to work as a custodian for Prairie High School until his health forced him to retire in 1986. He belonged to Grace Foursquare Church. were the most important focus of his life. He was a devoted son and called his mother every day. He lived for spending time with his granddaughters. Dewayne is survived by his wife, Shirley at home; mother, Ruth Hanson of Vancouver; sons, Troy of Vancouver and Trenton of Camas; brother, Ray Hanson of Kalama; sisters, Sherrill Losey of Champion, Alberta, Canada, Linda Bolle of Orting, WA and Bonnie Duback of Vancouver; six granddaughters; and two great- granddaughters. He was preceded in death by his daughter, Bobbi Jean; father, Palmer; brother, Palmer; and sister, Lolly. An informal graveside gathering will be held at Park Hill Cemetery in Vancouver on Friday, July 31, 2009 at 5:00 p.m.
To send condolences or sign the online guest book please visit www.straubsfuneralhome.com. Straub's Funeral Home and Columbia River Cremation in Camas was in charge of the arrangements.